The history of the Pierle valley is closely linked to the history of the magnificent castle ( la Rocca ) that dominates the countryside below. The first recorded mention of the Castle of Pierle dates back to the 10th century, when the estate is listed as part of the will of a member of the Marchesi Monte Santa Maria Tiberina family. 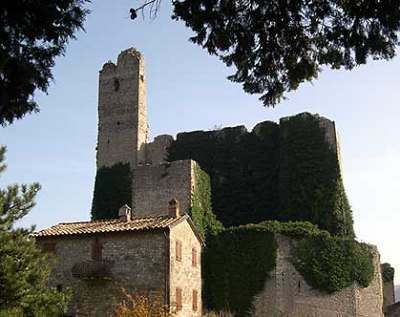 The castle continued to feature in official documents until 1325, when it is listed as having been granted to the Degli Oddi family of Perugia by the conqueror Visconti . It was completely rebuilt in 1371 to designs by Ranieri Casali, a Knight of Rhodes, for the Casali family that ruled over Cortona at the time and later became lords of Pierle, as mentioned in an inscription that still exists at the Rocca di Pierle and which is also referred to by Paolo Uccello in 1853 in his “History of Cortona”. The turbulent history of the castle is too long to be narrated here, but in 1576 the Grand Duke of Tuscany Francesco de’ Medici ordered its destruction, allegedly to free the area of marauding bands of brigands who terrorised the region in the late 16th century and would find safe haven in the nearby mountains. In 1428, for the price of 1200 ducats, the Pierle valley bought its political, economic and legal independence from Cortona, under licence from the Republic of Florence. Soon after becoming a free Comune, the territory of the valley was divided into three areas known as ‘terzi’: Pierle. Mercatale and Lanciano. From the records that have survived, the valley seems to have been a relatively inhospitable place. The river Niccone had no embankments so that heavy rainfalls often resulted in floods that would destroy crops, generating an overall condition of financial instability for the people. Many locals in fact resorted to alternative means of gaining a living, such as cattle farming or textiles – silk in particular. Trade was mainly with Cortona and the nearby Corbello county, often amid considerable hardship on account of the extremely poor road network of the region, which boasted only dirt roads and mule tracks. Once embankments had been built along the Niccone, living conditions improved and the population grew, although the valley lost many of its privileges when it was once more annexed under the control of Cortona.